Statue of Unity, the world’s tallest statue, is quickly emerging as a top tourist spot in India. 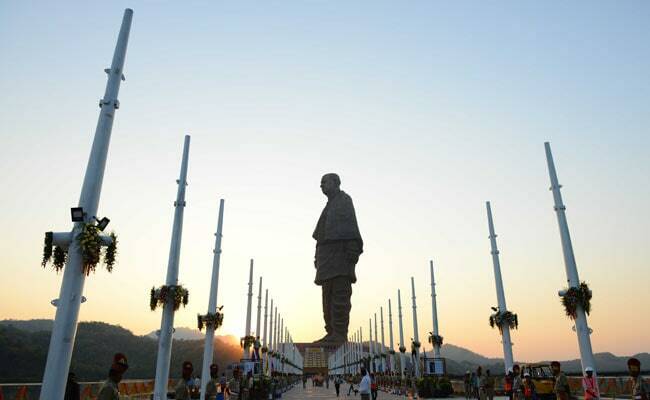 VADODARA: The 182-metre tall Statue of Unity, dedicated to Sardar Patel in Gujarat’s Narmada district, is quickly becoming one of the top tourist spots in the country and is now attracting about 30,000 people every day, senior state officials said on Monday. Both Gujarat Chief Secretary JN Singh and the state’s Principal Secretary (Tourism) SJ Haider put the number of visitors over the past few days at 30,000. The world’s tallest statue, located on an islet on the Sardar Sarovar Dam in Kevadiya, was inaugurated by Prime Minister Narendra Modi on October 31. United States Consul-General Edgard Kagan visited the statue on Monday. He also spent time at the viewing gallery, located at a height of 153 metres. “The statue is very impressive and I’m happy to learn the purpose behind its construction,” Mr Kagan said after the visit. Mr Kagan later visited Abhinay Gram Vikas, an NGO based in Rajpipla, which works for tribal welfare and rural development.